Last Saturday, I got to see Chick Corea in concert. Yes, that's right, Chick Corea. Even though he only played seven charts, the nearly two hours seemed to fly by, and before I knew it, it was time to leave. I was only familiar with three of the seven charts that he played. Although this did not detract from my overall enjoyment of the concert, I did notice something interesting. I found it to be much easier to "get into" the charts that I knew, as opposed to the ones that were unfamiliar to me. As I mused over this concept, I came to the realization that although I was hearing all of the charts in the same fashion, I was listening to them in completely different ways. I knew "how" to listen to some of his charts. I knew the melody, the chord progressions, and the rhythms. I knew what I was "supposed" to listen to, or if nothing else, what I personally wanted to listen to. It was exciting to know that my favorite part of the music was coming up, or to notice how he diverged from the recording that I had come to know and love. On the other hand, I was left "in the dark," so to speak, on his other pieces. Because I was listening to them for the first time, I could do nothing more than sit back and just take it all in. My mind moved from an active to a passive state, and as a result, I was unable to appreciate these charts on the same level as the others. I've also experienced this phenomenon in the drum corps world. I'll admit it: It was much easier for me to get into the Cavaliers 2004 show than it was to get into Santa Clara's. Why? Because I recognized the James Bond themes. Until this past summer, I had never before heard of "Scheherazade." To tell you the truth, I had never before heard of Astor Piazzolla either. It wasn't until I actually took the time to check out the original recordings that I was able to fully appreciate what had just been put onto the field. When I got home from the Chick Corea concert, I listened to the original versions of "Spanish Fantasy" and "My Spanish Heart," and then listened to the 1994 Blue Devils. I was completely blown away. I was able to appreciate the show in a much deeper way because of my new understanding of the original. My level of entertainment was heightened because I was able to actively participate with the music being created. Thanks to my newly attuned sense of awareness, I am listening to as many original recordings as I can of the musical selections that will be gracing the field in 2005. So far, it's been a wonderful experience. I highly recommend that everyone else join me in this musical journey. It will make the summer a much more enjoyable experience. Besides, with ticket prices rising, don't you want to make the most out of your dollars? 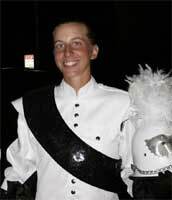 Lanah Kopplin is a third-year euphonium player in the Phantom Regiment, and previously spent a year with the Pioneer. Lanah recently graduated from the University of Wisconsin (she's a Milwaukee native) with a political science degree, and will age out in 2005.